When growing in the ground, crape myrtle shrubs and trees are exceptionally easy to grow and care for. Crape myrtle growing in containers will require a little more attention to watering and more fertilizer. When established, crape myrtle are not heavy feeders. However, they will benefit from fertilization at any time during their life. Fertilize them in early spring with a slow-release shrub & tree food, preferably one that contains Sulfur and/or Iron. Alternatively, you can feed with a natural organic plant food. To avoid stimulating new growth that could be damaged by an early frost, cease fertilization two weeks prior to the average first frost date in your area. Crape myrtle growing in containers will appreciate a little more fertilizer for best foliage color and bloom. Use a slow-release or water soluble fertilizer listed for use in containers. Start fertilization when new growth begins to appear in spring and then as directed on the product label. Cease fertilization two months prior to the average first-frost date in your area. Crape myrtle grow best in an acid to slightly acid soil ranging from 5.5 to 6.5 on the pH scale. Most average garden soils fall between a pH range of 6.0 to 7.0. If you're unsure about the pH of your soil, or whether or not it's suitable for growing crape myrtle, it's a good idea to test the soil pH in the planting area. You can quickly test soil pH with an inexpensive soil pH tester probe. To raise the pH (make more alkaline) you can add pelletized limestone to the soil. To lower the pH (make more acid) you can apply Soil Sulfur, Aluminum Sulfate, or Chelated Iron. Adding organic compost to the soil or using compost as mulch can also help to increase acidity and maintain acid soil conditions. Established crape myrtle are quite drought tolerant. When young they will benefit from a consistently moist soil to establish roots. Here's some tips for watering them. Immediately after planting deep soak the soil in the planting area, including the rootball, to a depth equal to the height of the root ball. For an extra boost, you can water your newly planted crape myrtle with a solution of Root Stimulator, which stimulates early root formation and stronger root development. Root Stimulator reduces plant shock and promotes greener, more vigorous plants. In the Ground: In average garden soil you should not have to water your newly planted crape myrtle every day. More often than not, this causes soggy soil conditions that can lead to root rot and other harmful plant diseases. In the absence of sufficient rainfall, water only as needed to keep the rootball and surrounding soil damp to moist. In Containers: Regarding crape myrtle growing in pots or other containers, you'll need to pay a little closer attention to soil moisture. Using the finger test, check soil moisture frequently until you get a good idea how often your plants will require water. When the top inch or two of soil is dry, provide some water. Keep an eye on the foliage. When leaves are curling or wilting this could be an indicator your plants could use a good deep soaking. Always do the finger test before watering. Note: Keep in mind that deep soaking less frequently, allowing the soil to dry out somewhat before watering again, is much better than splashing just a little water on the plants every day. Crape myrtle planted during the winter dormant season, when plants are not actively growing and evaporation is much slower, will require much less water. Therefore, be extra careful not to overwater during winter! 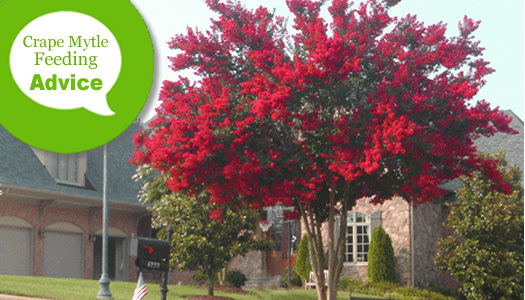 Only during longer periods of drought will established crape myrtle require supplemental water. If you see new leaves wilting or the tips of new stems bending over during dry weather this could be a sign your plants could use a good deep soaking. While in bloom, it's always a good idea to provide an inch or so of water every week during a drought.